In an earlier post, I wrote about how TweetQureet was born. TL;DR: it’s an automated tool which learns my top topics on Twitter. It collects all the tweets on these topics from my timeline – 24×7 – and delivers them to me in an email each day. This was the first piece of functionality I wanted to solidify. As a TweetQureet user, you’ll receive a daily email. This summarizes the interesting tweets from your timeline over the last 24 hours. The summary tries to cover a broad cross-section of your topics (based on TweetQureet’s analysis of your interest graph). The email will contain at least 2 and no more than 10 tweets from your top-tweet pool. Since TweetQureet is written in 100% Go, this programming language (aka #golang) is of my top Twitter topics. What if a given day is particularly heavy on “golang” tweets? 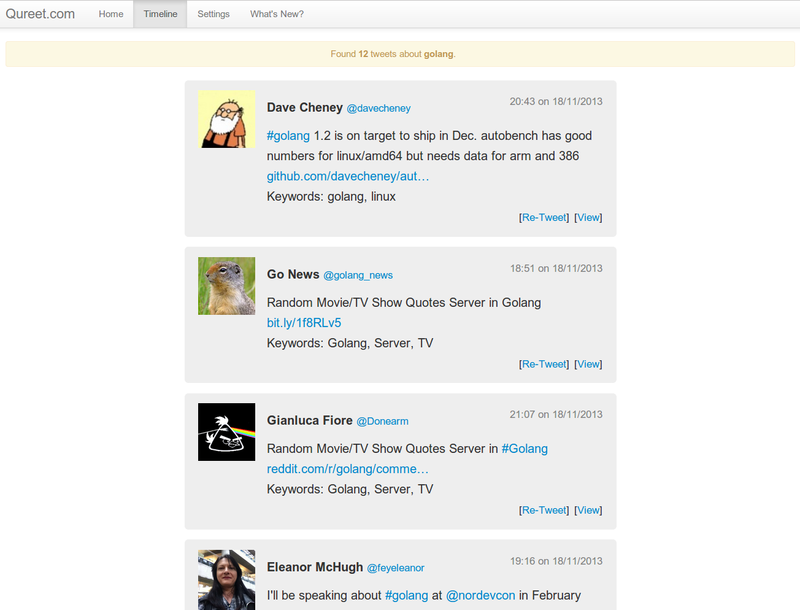 Say one Tuesday my followees publish 25 golang tweets in total. Clearly, that’s too many to fit in my TweetQureet digest email. This is especially true if tweets for my other topics have also been captured. 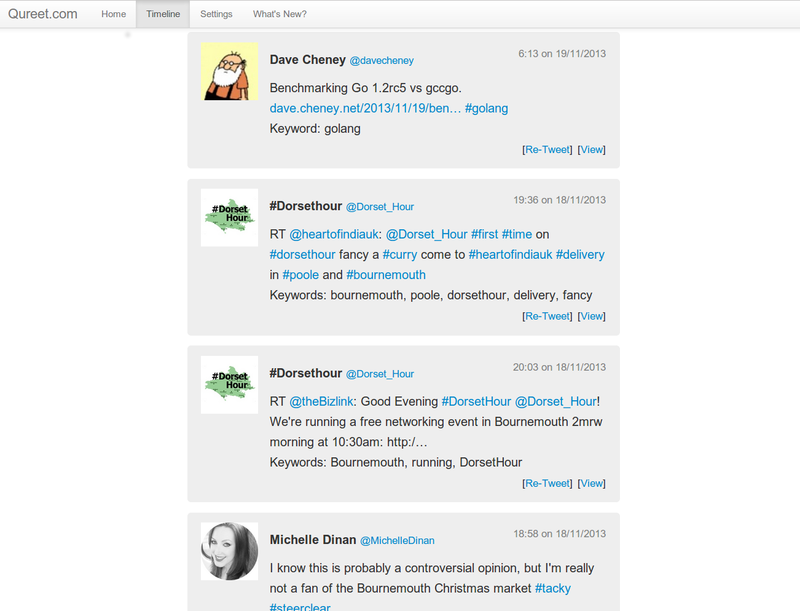 Using TweetQureet in this way gives you a fast, clean webpage listing tweets for each of your topics. The URLs for these pages can be bookmarked, and are updated daily. 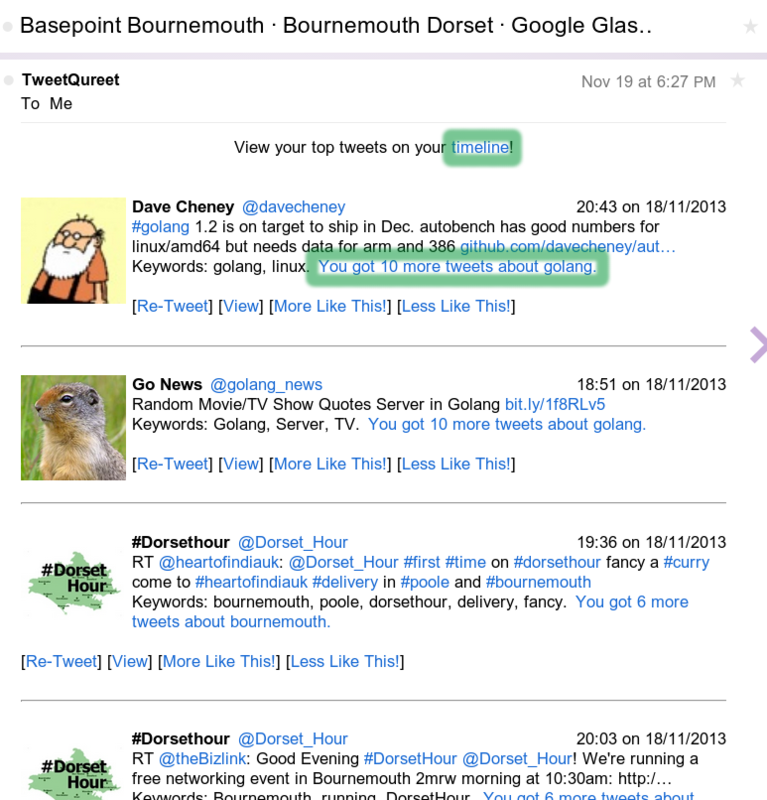 You can access them anytime – even if you don’t have your latest TweetQureet email to hand. What’s more, your timeline pages are stored each and every day. So TweetQureet actually gives you a historical database of your top tweets – with a new page for each of them published every day. This is very helpful if, for example, you’re using Twitter to track stock market sentiment about your portfolio. It’s also really useful for journalists who need to research their news stories. If you have comments or questions about this functionality – or feel that it could be done better in another way – I’d love to hear from you in the comments below!